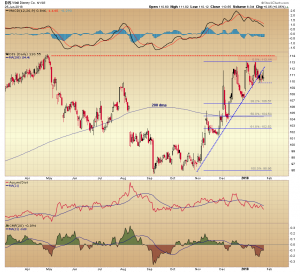 Disney – Time For A Pullback? At the beginning of the year it looked like Disney (DIS) shares were advancing towards a retest of their 2017 high, but now it looks like they will come up about a buck short. The stock price had been making a steady series of higher highs and higher lows over the last three months. A well-defined uptrend line defines the move. This month, however, the upside momentum has waned with the $113 level now acting as resistance. This week the uptrend line was broken. Disney has now pulled back off the $113 level and has been trading in a narrow range above the $110 level. Moving average convergence/divergence made a bearish crossover in December and has since been tracking lower. This is an indication of the short-term decline in positive momentum and trend direction. The accumulation/distribution line crossed below it 21 period signal average and Chaikin money flow is in negative territory. These readings suggest the stock is seeing selling pressure and is under distribution. The price action and the technical indications imply a pullback, likely triggered by a break below the $110 support level. How deep a decline is speculation but the Fibonacci retracement levels do provide some context. 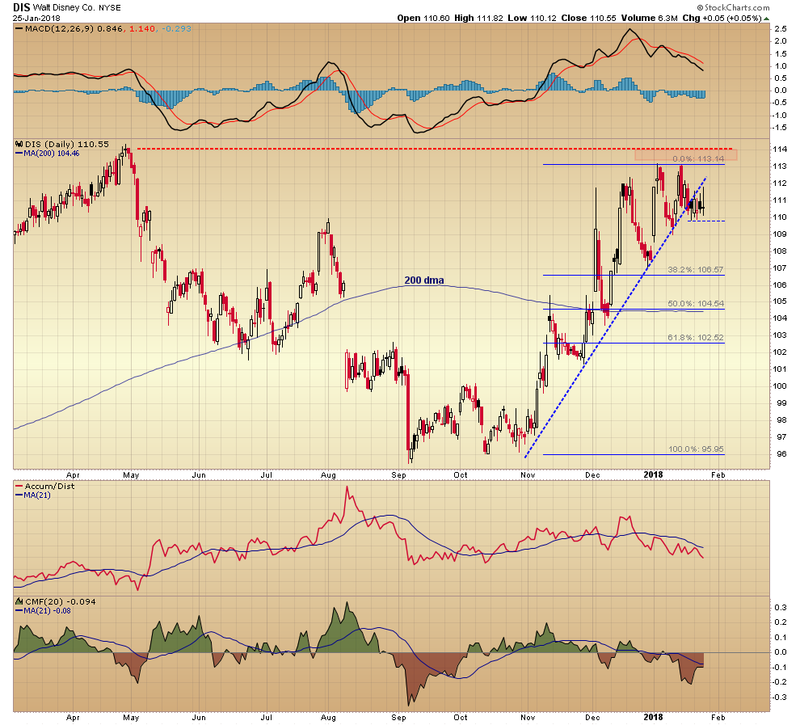 A move down to the 50% level in the $104.50 area, would coincide with a reversion to the 200 day moving average.